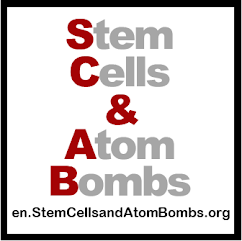 en.StemCellsandAtomBombs.org: Do you have the right to question Rick Hansen? I have posted this blog and also sent it to a Mr. Cam Tait from the Edmonton Journal who runs a blog called Tait Talk where the two blog posts I mention below are published. I've asked to also be a guest blogger offering a counter argument from someone who has dealt with the Rick Hansen foundation for a number of years. I also urge you to make your own comments directly on the blog posts in question by following the links below. I have spent two years organising members of the spinal injured community to seek answers from the Rick Hansen Foundation about their real spending on a cure for spinal cord injury, and especially chronic spinal cord injury, and we have never ever been provided with this figure. We asked about future plans including projects and spending, and were never answered with any numbers. When you can't get an answer to a simple question from an organisation which raises funds for "a world without paralysis after spinal cord injury" people really start to wonder about the financial stewardship of public funds and donations. I don't think any of us were surprised after reading David Baines' story in the Vancouver Sun pointing out an $8.1 million deficit (at the end of their 2012 financial year), gratuitous self-promotion, and Mr. Hansen's own bloated salary. What I was surprised by was two blogs written by guest bloggers on Tait Talk run by Cam Tait of the Edmonton Journal. The first blogger, Ms. Marie Renaud Martin, almost knocked me out of my chair when she talked about Hansen falling short of his fundraising goals. Falling "short" is one of the biggest understatements I've heard in a long time. They spent 17 to 19 million with a goal of raising 250 million but in the end only 84 million was raised. Well, you may say that they more than quadrupled their initial outlay, but then if you look at this 84 million, you start to see that most of it was simply a renewal of existing funding. In fact, RHF's revenues did not see any significant change pre and post 25th anniversary spending, but instead they are now saddled with a deficit. So how does Ms. Renaud Martin defend this? She says, "So what?" Well, Ms. Renaud Martin is very generous in her forgiveness because she states, "He has given his adult life to raising awareness." And then goes on to disparage Baines' article by questioning how much positive impact he has had on the world. I myself say; so what? How does this let Rick Hansen get off for his troubling financial stewardship? How much money is he allowed to be off because he is a good guy? I would love Ms. Renaud Martin to supply us with a figure. To her, Rick Hansen's salary is of no concern, so again I would like Ms. Renaud Martin to offer us a salary figure that she would consider to be too high. In fact, Rick Hansen is paid at least $50,000 more than the highest paid charity executive in British Columbia while all other BC charities paid less than $300,000. The second post written by Ron Plant is even more shocking. First he questions Baines' motive in writing the article as if there was some deep dark reason for writing the story in the first place, even though Mr. Plant doesn't even suggest what that motive would be. Well, Mr. Plant, that's what investigative reporters do. Should he have written another media/Rick Hansen love fest piece? But what is most shocking is that Mr. Plant questions Baines' and even your own right to ask for full transparency from this organisation which is funded by tax dollars and private donations. He asks, "What business is it of David Baines, how the Rick Hansen Foundation is run, or what compensation Rick Hansen receives?" And then goes on to say that Mr. Hansen does not owe the public any explanation. Wow! Does he know what he saying? That would be like arguing that the current Senate spending scandal has nothing to do with the average taxpayer. Again, Mr. Plant gives Hansen a pass because, "Rick Hansen is a man who has made huge strides in affecting public perception of persons with disabilities." I'm sure that we could get a few people to say good things about the current Prime Minister and then I guess Mr. Plant wouldn't be bothered if Stephen Harper raised his salary to 400 thousand a year. Both these writers offer no facts, just emotion. They remind me of those who questioned our right to ask for financial information about cure spending. The arguments were the same. Because they had no concrete reasons to challenge our campaign questions for financial transparency, they appealed to simple emotion. 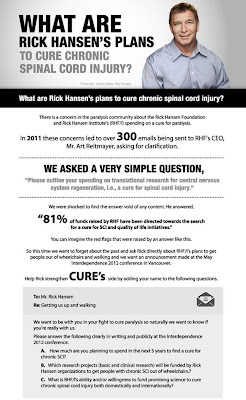 In fact, Rick Hansen himself, when asked our questions face to face at a conference, challenged our right to question by basically asking us how much money we have raised. Mr. Hansen and both of the writers forget that the money doesn't spring from some Rick Hansen well, but comes from me and you through taxes and donations. 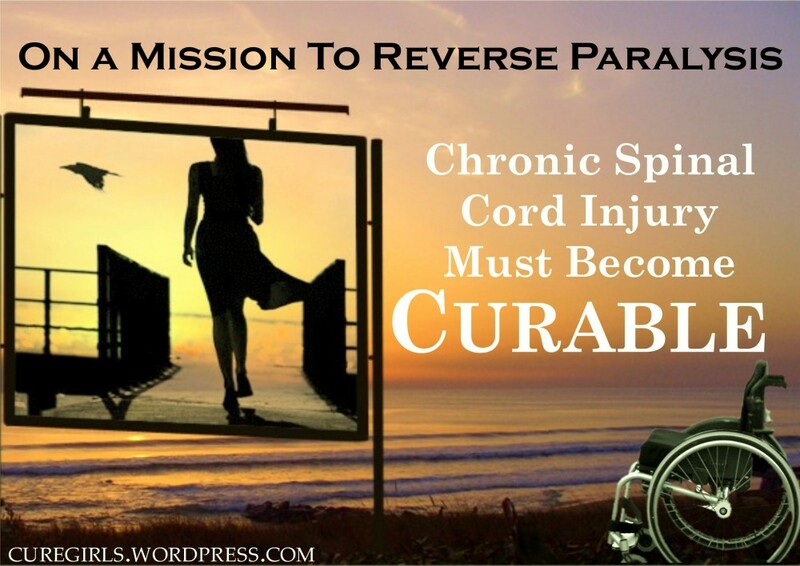 We all have a right to ask for information about OUR money and money raised in cure's name, and we should never allow emotion to overrule our minds and do what is right when it comes to both money and a cure for spinal cord injury. To read David Baines’ full article, please click here. To read a summary with charts of Mr. Baines’ information, please click here. Once again, I invite you to make comments directly on Ms. Marie Renaud Martin and Ron Plant’s blog posts. Let them know that their thinking is out of line with the rest of society. THE PEOPLE had the right to inquire about funding and the spending of government tax payer driven initiatives by Health Canada within this foundation long before this disclosure came to light. Without the proper oversight in place, the Foundation was allowed to continue on, undaunted by persistent questioning and grave concern by the lack of funding actually making it to the researchers working on spinal cord injury. The rising voices of the people can no longer be ignored. This mismanagement of taxpayer money must stop. The hero worshipping will surely stop so enlightened people can finally make sure that the millions of dollars are going to initiatives that will truly make a difference and move the research forward for ending paralysis. The sheer waste of time and money is outrageous. The time is NOW for Canadian officials to step in to end the party and oblivious officials within this enormous cash cow, that manage the government entrusted money. You bet we have the right to ask questions. It's our money! Step up to the plate Canada!!!!!!!!!!!! Your link doesn't have a damn thing to do with the Rick Hansen Foundation. Move on troll, you can't read. Here's the correct link troll. Bob, The article posted above here is about two blogs written by guest bloggers on Tait Talk run by Cam Tait of the Edmonton Journal. Read the article here before posting comments to Ron Plant and Marie Martin. These people don't have the slightest interest in your link. aint it a goofy idea to have Sam post about Ricky? Yes it is. They're sister orgs. I hope these financial disclosures result in actions being taken so that spinal cord injury research starts getting funded. This is what happens when the Canadian government turns responsibility for research funding over to a private foundation that squanders the money and we're left with empty hero worshipping and more excuses why spinal cord injury can't be cured. It can be, but it requires funding to get to the relevant research labs, and not the hip pockets of foundation employees. A shameful situation for sure. I've made posts where the articles were posted by Ron Plant and Marie Martin. The pervasive attitude was shocking. They need to do a lot more research into this before writing such articles. They were a huge disappointment. Nobody should give RHF a pass like that. These bloggers to the rescue of RHF need to be educated about the inside story. The emotional plea to save Hansen was incredibly silly. I hope we don't see more of these sentiments posted by Hansen fans. It's a gross disservice to the community. Everyone should post and tell them that it is not helpful to get to the bottom of this ongoing problem. We not only have the right to question, we have the responsibility to do so. Nothing will change and research will not take place to actually cure paralysis if we don't start making a stand against the abuses of trust in these large organizations. Accepting responsibility isn't taking the easy way out and just condoning the actions will won't make things better. Not now and not in the future. We must take a stand.